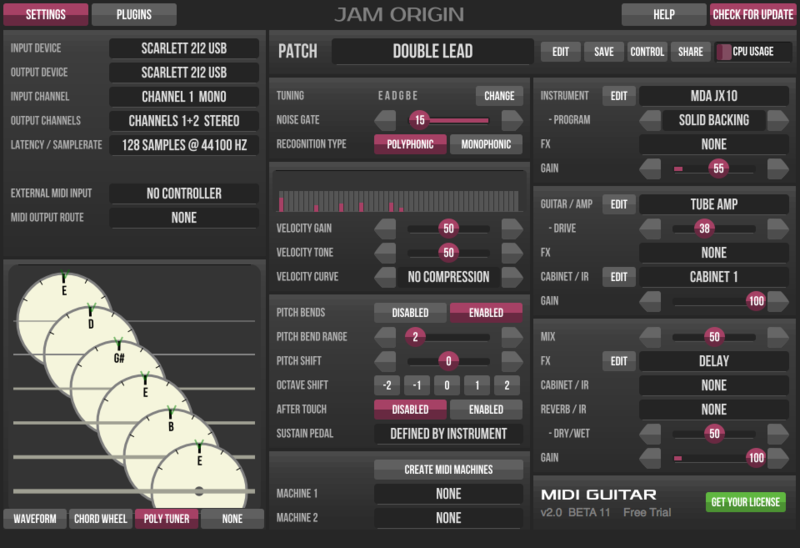 MIDI Guitar 2 BETA 12 and MIDI Bass BETA 3 are now available to customers. This is our first unified release which means that the two products are now identical, apart from the underlying tracking engine and the colour scheme. Both products come as VST, AU and standalone applications for 32- and 64-bits Windows and Mac systems. Moreover, we have managed to port the same application to iOS, and so the MIDI Guitar App for iOS will get an update that is almost a 1:1 port of the desktop version, which is currently only awaiting Apple’s approval. Another newsletter will follow regarding the iOS release. Compatibility fixes: The main focus for this release was to address remaining compatibility issues and at this point there should be very few compatibility issues left. Issues with the plugin scanner should be resolved, but you need to do a new scan for plugins with the new version. On Windows we have made some changes related to handing audio interfaces in order to addressed compatibility problems with some ASIO audio interfaces. (please let us know if we have introduced any new problems – we’ll fix remaining issues immediately, if we get rapports). Pitch bends: The latest update finally brings very accurate pitch bends and vibrato. Just remember to sent the pitch bend range to match the range of the synth (usually 2 or 12). Amp Cabinet Mining: This release has a small innovation that we haven’t seen elsewhere in guitar effects and amp sims that just deserves to be mentioned: As you probably know MIDI Guitar can load impulse responses to simulate amp cabinets reverberation and microphone placements, etc.. Well.. now it has a billion billion amp cabinets responses right on-board, included. Obviously even if mankind unite we’ll never be able to hear them all, but you can get a random one and whenever there is something you like you can make it get you something similar. There is certainly a space there for unique tones and we are very curious what is to be found in there… so please let us know when you find something great. We intend to do much the same for reverbs. Customers: Run any version of MIDI Guitar 2 to get an update notification and download link. Non-Customers: Sorry, not yet – you can get BETA4 at the downloads page. MIDI Bass BETA 3 – VST/AU plugins MIDI Guitar 2 for iOS is here!